Home / Farmhouse Line / Sweet Goat Tile~A friend from the farm. Goats are one the quirkiest animals on the planet. You can’t help but love them! This sweet little 4 Inch Goat tile is just for you! Incorporate a bunch of goat tiles in a country kitchen backsplash or add the goat tile with the rest of his farm friend tiles. Adding this happy little goat tile to your tile project will make you smile for years to come. Choose tile that is meaningful to you…Choose Fire Creek Tiles today! I love goats for their curious and mischievous personality! 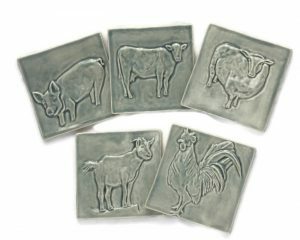 The goat tile is hand crafted from stoneware clay, high fired for durability. I can see this 4 inch tile dressing up a country kitchen in our cheery green celadon or sky blue glaze. Group them all together and get yourself a herd of goats or pair this adorable chap with the noisy rooster and the fluffy sheep. Coming soon, the Dairy Cow and the Pig tile! We have several glazes in our shop for you to choose from. A variety of colors to match any tile installation and décor. We can help you achieve the look of your dreams. Fire Creek crafts each tile just for you, so please allow 4-6 weeks delivery. Do you still have questions? You can find answers to our frequently asked questions HERE. You don’t have to have the same look that all of your neighbors have. Choose tile that is meaningful to you and reflects your personality. Choose Fire Creek Tiles today!